Out in the garden, the quamash is starting to bloom. This particular one is Camassia leichtlinii coerulea 'Blue Sky'. 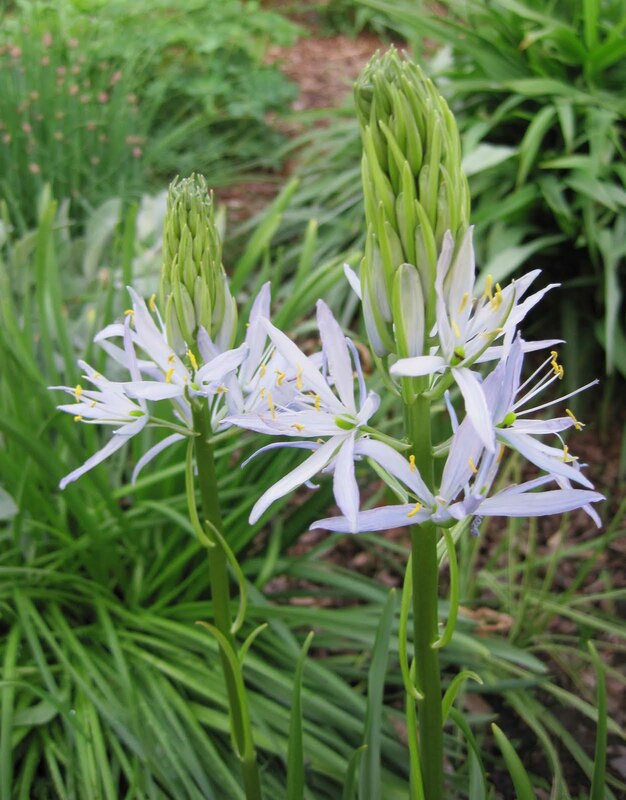 I planted bulbs for it last fall after seeing quamash in bloom the previous spring at the Chicago Botanic Garden. I like these blooms, so these are keepers in my garden. Elsewhere a new columbine has started to bloom. This picture doesn't really show how red the flowers are, and how plastic-y they look. I bought this on a whim at a garden center. I'm pretty sure I bought it because all their perennials in one gallon pots were $9.95 each, or buy three for $27.00. To save that three dollars, I probably searched high and low and found this and got it. I don't like it. It looks fake. It is too red. 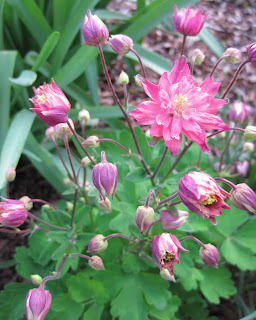 I think it is going to clash with other columbine flowers in my garden. Horrors, it might cross with some of them and who knows what those flowers will look like if I let this go to seed and self-sow? What I really want is a pale yellow columbine. Wouldn't that look great with the quamash? Sure it would! Now the question is... what should I do with this columbine? a) Leave it. I might change my mind and like it. b) Dig up the plant and give it away. c) Move it someplace else in the garden where I don't see it so often. Following any of these actions, I will then renew my oath... "Only buy plants I truly love. Do not buy to fill the cart." Oh, and my other oath when buying perennials "Do not buy 'one of 'anything." Unless of course it is a special specimen type plant. Or it looks like I could divide it before I plant it. Or if I really want it and they only have one. Or if it is realy expensive. I must know someone who thinks this is the prettiest columbine they've ever seen. I feel the same way about that Columbine! If 'Blue Sky' begins to make you feel that way, pack her and bring her to Buffa10. I will gladly give her a home ;~} H.
I'd take it out. I once planted a very dark, frilly Mrs. Barlow columbine, thinking it was really cool. NOT! Ugly...not enough for it to play off of or to even to be showy. I'll take the native species or about any other columbine than Mrs. Barlow. You can surely find someone to take that poor unloved plant. Maybe your sister. Too bad I odn't live closer. I would take that poor unloved columbine. I would plant it by the dark blue one that I am not so fond of and maybe they would make some lovely mauve blooms together. I'm glad you decided to go with D, Carol. Not only do I buy 3 of something to save $3, I also don't throw away any flowers, even if I don't like them. Donate to a good cause! My In-laws participate every year in a plant sale to benefit their local humane society. MIL digs up some of her "stuff" and donates it to the sale. Someone out there would find this columbine to be a gem in their garden, I'm sure of it! Yep, give it someone who will love it. We gardeners have a hard time throwing something away, no matter how much we dislike something. Just tried to pawn off a rather ratty looking cedar to my neighbour. Don't know why she didn't want it. That's the wonderful thing about gardens, plants, and life. There is always someone with a different aesthetic who can be made happy. I'm afraid I am probably in the "compost it" camp. Unless there is a willing volunteer who wants it, the possibility that an unwitting recipient will have the same reaction you did is very high. I have some doubled columbines here, and I have never seen a single seedling spring from them. I suspect that the poor things are so overbred and full of DNA that they may not be able to make seeds. Anyway if it does cross pollinate it may revert to the more normal type. Columbines are such good colonizers that if you aren't seeing babies by now, you probably never will. I have never fallen for the 3 (or however many) at a discount. I can multiply. If I need two items and I buy them at full price and don't get the discount, according to your example I will have spent $20 only and not $27. I do not see how buying one more plant actually saves me money. But no one could accuse me of being any sort of shopper. I tend to go on my shopping expeditions armed with a list and with a certain amount of money I can spend. And sometimes ONE is all I can afford, period. The joys of being self employed in a dicey economy. I think potting it up for a plant sale is the best idea. Like healingmagichands, I am a "one of each plant" buyer. I have confidence in my ability to divide plants, the patience to wait, and the tight budget to motivate me. When I buy one, I rarely expect it to remain one. I plan (if it makes it through the first winter) to make more of it. Some flowers just look too fake...I feel that way about passion flower. I'd give it away or at least move it...maybe put it in a pot for the time being. Beauty is in the eye of beholder. Gee, I'd happily take that Columbine off your hands. But I live too far away from you to receive it. Definitely don't compost it. None of my Columbines face up like that, they are all droopy down-facing flowers, and solid colors in either pink or purple. Except for the Aquilegia canadensis, which is yellow and red. Columbines are relatively early bloomers anyway. See what happens the rest of the year before you chuck it or give it away. I would happily take that red columbine off your hands too! Love red, love columbines. The Camassia, on the other hand, I had in a previous garden and did not like. It just didn't bloom for a long enough time to make an impact. I know the feeling. Sometimes a place can be found. I find that flowers will sometimes look better with different companions. But I usually look for those companions are in someone else's garden. Good luck. To each his own! Someone will LOVE it! Good choice Carol. I would have troble putting it in the compost and to move it would mean taking up space where you could plant something you really like. A pale yellow sounds beautiful with the Blue Sky. Another exception to the don't buy only 1 rule is if there is only one of the plant left on the table. That seems to happen to me a lot. Good call on finding that plant a new home. Hopefully its new owners will appreciate its unique qualities. One man's thrash is another ones treasure. Some plants you may grow to love/like over the years. Give it some time, haste makes waste. Hahaha, i second Helen, the islandgal246. In my case it is beautiful because we dont have it here in the tropics. It happened to me about the orange amaryllis, Hippeastrum spp., i posted it a few weeks ago. They were dug and thrown away since i was young, yet they persisted! Now i am trying to be kind to it because they are simply beautiful. Pls try to look at my photo of them and you will know what i mean, especially when viewed as hedges. thanks. We gardeners are so prone to falling in love, and then falling right back out again. I don't like some of my plants, but it always feels heartless to throw them out. So I have little giveaways once in awhile, on mini garden tours. "Oh you like this one?" Here, it's yours....ha.